A federal trial judge Monday became the first U.S. judge to declare the current federal death penalty unconstitutional, a ruling that is sure to set off fierce national debate over the issue. U.S. District Court Judge Jed Rakoff issued a 28-page ruling reaffirming his earlier opinion that the death penalty act violated the due process rights of defendants. It "deprives innocent people of a significant opportunity to prove their innocence" and "creates an undue risk of executing innocent people." The federal government was expected to appeal the ruling, which would not affect individual states' death penalty statutes. Legal scholars believe he is the first judge to declare the current federal death penalty law unconstitutional since it was enacted in 1994. Rakoff found that the best available evidence indicates that, "on the one hand, innocent people are sentenced to death with materially greater frequency than was previously supposed and that, on the other hand, convincing proof of their innocence often does not emerge until long after their convictions." If the ruling is upheld by the U.S. 2nd Circuit Court of Appeals, it could stop federal executions in New York, Connecticut and Vermont. 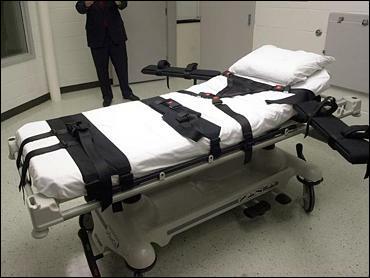 It would have no effect on cases in state courts in the 38 states that have capital punishment. However, Richard Dieter of the Death Penalty Information Center senses a growing trend. "At some point the Supreme Court is going to have to address this issue because this is the ultimate question," he told CBS News Correspondent Barry Bagnato, "whether we want to sacrifice some innocent lives simply for the sake of preserving the death penalty." The judge, who sits in Manhattan federal court, cited academic research on death row inmates who had been wrongfully convicted when he issued a preliminary finding on April 25 that federal executions are unconstitutional. In papers filed May 16, U.S. Attorney James B. Comey urged Rakoff to resist ruling on the issue at all until after a Sept. 2 drug conspiracy murder trial. Prosecutors noted that the Supreme Court had already concluded that the due process safeguards of the Constitution do not guarantee perfect or infallible outcomes. They also challenged the judge's conclusion that studies had shown numerous innocent individuals were being sentenced to death, saying the studies all involved state courts. In 14 years that the federal death penalty has been in place, none of the 31 defendants sentenced to death have later been found to be innocent, the government said. In the case before the judge, Alan Quinones and Diego Rodriguez, alleged partners in a Bronx-based heroin selling operation, are accused of hogtying, torturing and killing an informant, Edwin Santiago, on June 27, 1999.